that I am in the habit of making." 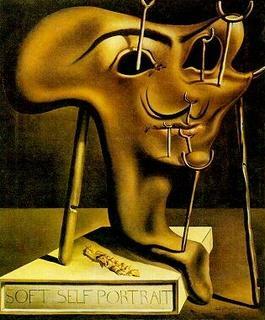 I had the priviledge of seeing the Dalí exhibition at the Phila. Museum of Art with my sister & brother when the dates were extended in May '05. We couldn't believe the volume of work assembled, but I told my siblings that is the mark of a true master. Creation is a natural and constant aspect of a master's life. 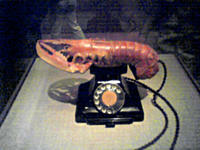 I was most amazed by the atomic mysticism of Dalí's later years, but my sister's mission consisted of simply finding the "Lobster Phone." I managed to snap a pic of this crazy piece of art using my camera phone without the attendants yelling at me (they were, however, yelling at my brother constantly to stop talking on his phone). Another piece that was cool was a 3D hologram of Alice Cooper. where you’ll be sent straight to America’s latest military quagmire. Where will it be? North Korea? Iran? Anything’s possible with Commander Cuckoo-Bananas in charge!" will be adorned by a downright moron." of getting government out of our personal lives." and yet, if I were to have them killed, I would be the one to go to jail! but the voters of this country." "A society of sheep will, in time, create a government of wolves." George Galloway is a British politician known for his outspoken, no-holds-barred rhetoric. He justs kicks the crap out of Bush and Blair's idiotic lackeys. He is also a major catalyst that allowed the Democrats & the Press to find their collective spine against the fascist Republicans in DC. Galloway reamed out Senator Norm Coleman ("pro-war, neo-con hawk and the lickspittle of George W. Bush") at a Senate committee hearing concerning his supposed involvement in the UN Oil-for-Food "scandal". Galloway has more balls than almost all of the US Senate. Goddamn... Simple, clear, and completely true. Thank you, Mr. Galloway for showing America how to put up a political fight against the fear-mongering war profiteers that the GOP leadership has become. 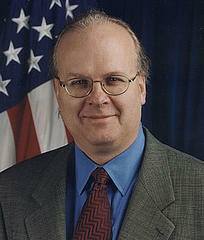 • Karl Rove is deputy Chief of Staff & head GOP political strategist. * The Bush Administration was looking for evidence of an Iraqi nuclear program to justify going to war. * Joe Wilson was sent to investigate such claims that he correctly and publicly proclaimed were false. 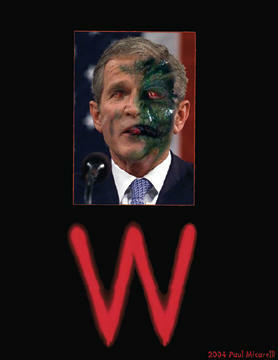 * Pissed off Bush Administration officials "outed" his wife & her front operation through media contacts. 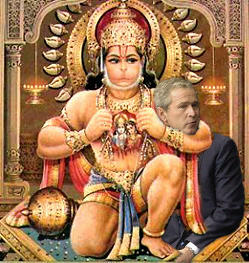 - Karl Rove is the political equivalent of monkey crap. - The people running things are deranged sociopaths. Mind you, this survey was taken in May 2004. Things were quite nice for Dubya then compared to the heat he's feeling over the numerous scandals his administration is facing now. This is a survey of over 400 historians who (unlike people who still believe anything George W. Bush says) deal with objective analysis. "So we make this big loan, most of it comes back to the United States, the country is left with the debt plus lots of interest, and they basically become our servants, our slaves. It's an empire. There's no two ways about it. It’s a huge empire." Video of Huge UFO Fleet over Mexico! This is the craziest thing I've ever seen. 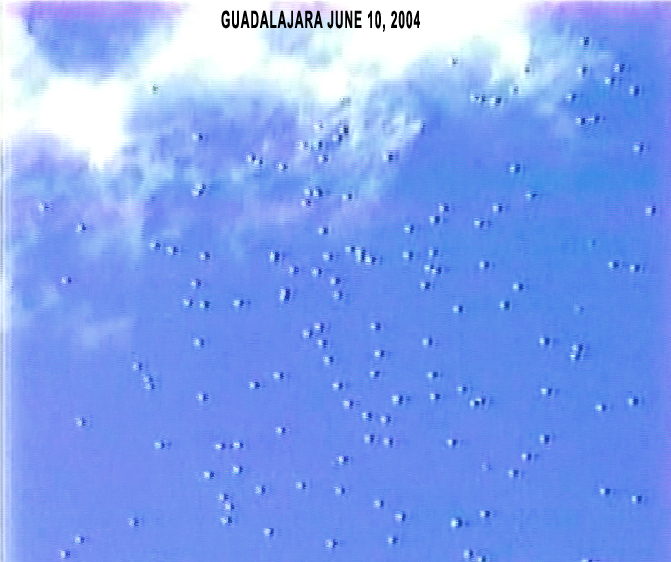 Mexican television stations caught hundreds of UFO's on video hovering in the sky. Check out this unbelievable video! 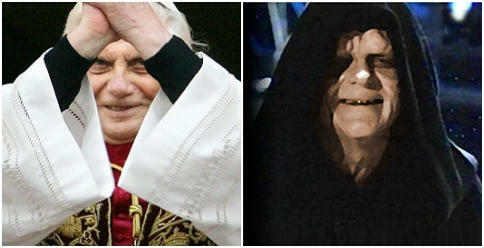 Wow, couldn't the Church elect someone who doesn't look like the most evil character in movie history? I wanted to wish a Happy Birthday to the quasi-human who robbed America of any appearance of democracy, our puppet emperor George Dubya. Enjoy it while you can, old pal, the heat's really coming down on you and the gang lately! I figured I might as well, because it will be the last positive thing I'll say on this blog about him. can defeat the idiocy of a Smirking Chimp! "RFK Jr. on the Bush War on the Environment"
The comments under the pictures are killing me. set up to terrify and enslave mankind, and to monopolise power and profit. which no human invention can counterfeit or alter, that God, speaketh, universally to man." is that nothing is to be taken too seriously." growth of our fellow human beings, that is our job. Those of us who have this particular vision must continue against all odds. by the wise as false, and by rulers as useful."